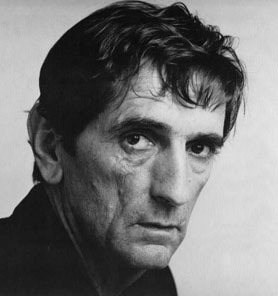 Craggy-faced character actor Harry Dean Stanton sang in a barber shop quartet in high school, and studied journalism in college. He dropped out after appearing in a college production of Pygmalion. He came to Hollywood, determined to work as an actor, and studied at the Pasadena Playhouse alongside Gene Hackman and Robert Duvall. After numerous bit parts on television, he found his first film work in Tomahawk Trail, a low-budget 1957 western starring Chuck Connors. He had a recurring role on TV's canine western The Adventures of Rin Tin Tin with Joe Sawyer. He played eight different characters in eight episodes of Gunsmoke with James Arness, and made dozens of guest appearances on other series, but Stanton is best known for his movie work. He played the prisoner who sang gospel songs in Cool Hand Luke with Paul Newman, the gay hitchhiker in Two-Lane Blacktop with Warren Oates, an FBI man in The Godfather, Part II with Al Pacino, a horse thief in Missouri Breaks with Marlon Brando, a doomed worker in Alien with Yaphet Kotto, the old friend who doublecrossed Kurt Russell in Escape from New York, a cocaine-driven Repo Man with Emilio Estevez, the dying father who sent his sons to avenge him in Red Dawn with Patrick Swayze, Molly Ringwald's unemployed father in Pretty in Pink, the apostle Paul in The Last Temptation of Christ with Willem Dafoe, an obsessed private eye in David Lynch's Wild at Heart, and lawn-mower-riding Richard Farnsworth's brother in The Straight Story. In a rare but remarkable leading role, he played the man who walked out on his family in Paris, Texas with Nastassja Kinski. In the late 1960s, he shared an apartment with another struggling actor, Jack Nicholson. They have remained friends, and worked together in six films. Stanton was not in Easy Rider, but he visited the set long enough to scrawl his name in huge letters, clearly visible on the wall of Nicholson's jail cell in that film. He sang at his friend Hunter S. Thompson's funeral, and he was memorialized in Blondie's 1989 hit "I Want That Man" ("I wanna dance with Harry Dean / Drive through Texas in a black limousine�..."). Stanton says he met Debbie Harry after the song came out, "and oh, we danced". Now in his 80s, he still works frequently in movies, and he plays a stern church elder on HBO's polygamy drama Big Love with Bill Paxton. He rarely talks publicly about his personal or romantic life. He has never married, but says he has "one or two children". He lives alone in a nice but nondescript house on L.A.'s Mulholland Drive, where his doormat is embroidered, "Welcome UFOs". In 1996, he happened to be home when burglars struck, stealing some pricey electronics and his Lexus, and pistol-whipping Stanton in his bedroom. He says he watches the Game Show Channel a lot, and in his spare time he sings and plays harmonica and guitar with The Harry Dean Stanton Band.